This week, I'm going to attempt to do some before and after posts of our house. We are by no means finished, but when we bought this house we knew it would be an ongoing fixer-upper. We've had a ton of help from friends and family with everything from childcare, to painting, to laying down floors and we certainly couldn't have gotten near this much finished without all the help. I'd still like to get a rug for their room and a new light fixture. 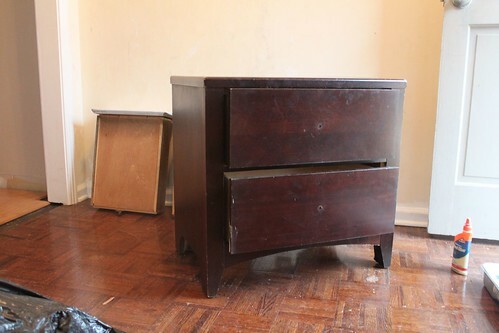 There's also a bookshelf that you can't see in these pictures that still needs to be painted. 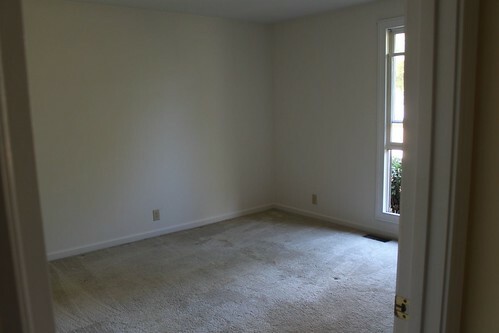 At some point in the near future, we'll move Eden in here as well. 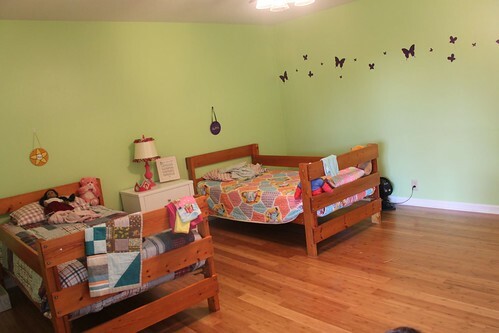 I'll probably slide Mya and Alena's beds towards the walls and put Eden in the center. Here is the after. 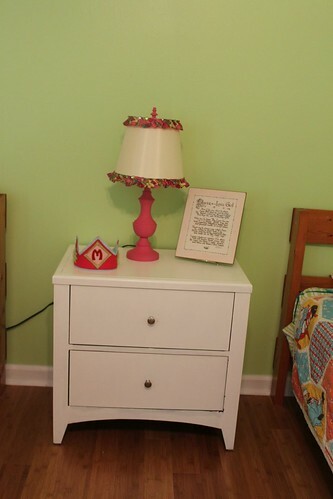 This was all Grandmama's doing and I so wish I had a before picture of the lamp. It was also a yard sale special. The base was black and the shade had a thin strip of black ribbon. I love how it turned out. 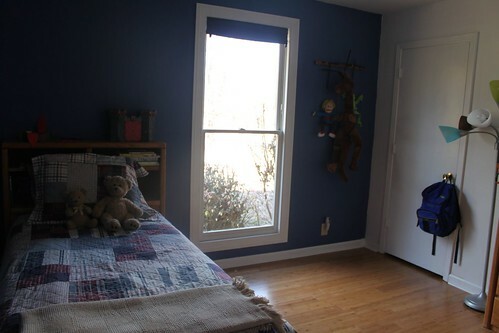 Here is a before of Gabe's room. His room is right beside the girl's room. Here is the after. The wall decals for his room and the girl's room I won from a blog a couple of years ago. I'm so glad that I saved them to use here. 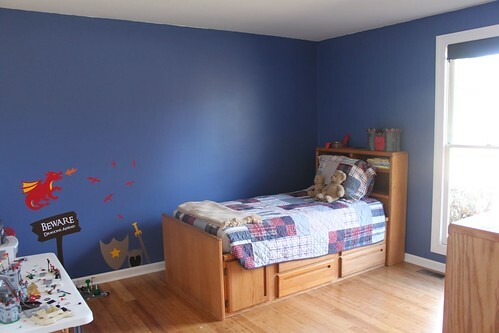 We only painted two walls blue and the other two are white. I didn't want his room to be to dark. Here's the other side; sorry the color is so terrible. I might also get a rug for his room, but it is much easier to pick up loose Legos without one so I might just hold off on that for a while. Stay tuned. Tomorrow I'll give a tour of the kitchen. Great pictures -looking forward to the rest! I'm so excited to see some pictures of the new house. 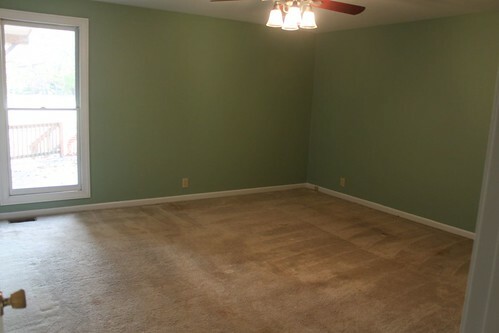 The kids' rooms look great.